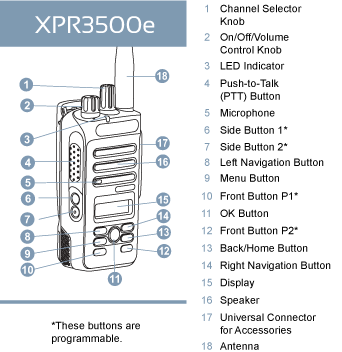 The new XPR3500e comes with all of the same features in the previous 3500 model with added enhancements, like WiFi for better radio fleet management, vibrate, and an improved IP67 rugged rating. Read our full description for a list of all the enhanced features. 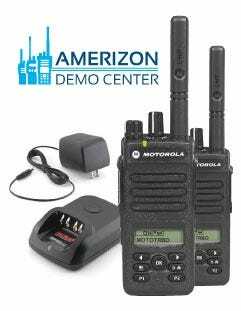 There is a lot to be excited about with this new, enhanced version of the Motorola XPR 3500. This radio has 128MB or RAM, double that of its predecessor. Flash storage has also been increased to 256 MB. The range has been increased by 5 to 8%. Battery life has been expanded to an incredible 29 hours. The XPR3350e utilizes new, low voltage batteries that are more efficient. 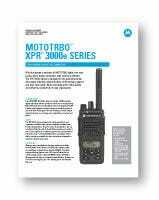 With an IP rating of IP67, the XPR3500e Enhanced MotoTrbo Digital Radio is completely dust-tight and waterproof to 3 feet for 30 minutes. With data rates of up to 8 mbps, the XPR3500e Enhanced MotoTrbo Digital Radio is able to connect with WiFi-networks using WPA, WPA2 or WEP. The Motorola XPR 3500e can be used with a vibrating belt clip to silently alert you of an incoming message. Having the belt clip vibrate rather than the radio, allows for a more powerful vibration that is easier to notice in a high noise environment while not adding distractions to a quiet environment. Experience clear audio with the Single microphone Industrial Noise Cancellations (SINC+) system. SINC+ filters out background noise by creating clear communications. Request an XPR 3500e Demo!